Sounds like a great trip! I love the illustration on the front of the card so typical of early 20th century advertising – this one promoting the superiority of a particular bike. The stamp is the latest (controversial) version of Marianne. Anne is loving southern Spain and making the most of her visit. Part of Mezquita Cathedral is pictured on the front of the card and the 40 pesetas of stamps feature King Juan Carlos I from the 1976-84 definitive series. Anne enjoys art and culture so, naturally, she is loving Barcelona! The card carries 45 pesetas of stamps featuring King Juan Carlos I from the 1976-84 definitive series and is postmarked ‘BARCELONA 27 JUN 91’, which is several months after the birth of the ‘new’ baby mentioned. It’s a great status update, from earlier this year (2017), about the minutiae of a life that is lived dealing with debilitating health issues, and food for thought for those of us lucky enough to be currently enjoying good health and a full life – make the most of it and be nice! C and I have been exchanging postcards for over a year now! Hers are always her own artwork, while mine to her are a mix of hand made and commercial ones that I pick up when I’m and about and think of her. A great little seasonal update, with a reminder to take time to enjoy the beauty that is around us. There’s no date or post mark on this, but it arrived at the end of December and carries the 2016 first class Christmas Stamp. The writing on the back describes Pulteney Bridge, featured on the front, as one of three bridges in the world lined by shops on both sides. The other two being in Italy, Ponte Vecchio and Ponte di Rialto. Another original design created by crazyruthie in postcard format; it must have taken ages to colour all those little shapes! The postmark is barely visible, you can just make out the number 7 on the right which, along with the text, indicates that this card was received early in 2017 (this year). The stamp is that Global universal stamp which, it occurs to me, may soon include the head and shoulders of the president! (Anything is possible). Here’s another message waxing lyrical about Ireland; Alison and the Bells certainly seem to be making the most of it 🙂 It looks very picturesque, however, for a professional shot, it is a shame that the horizon is not level! 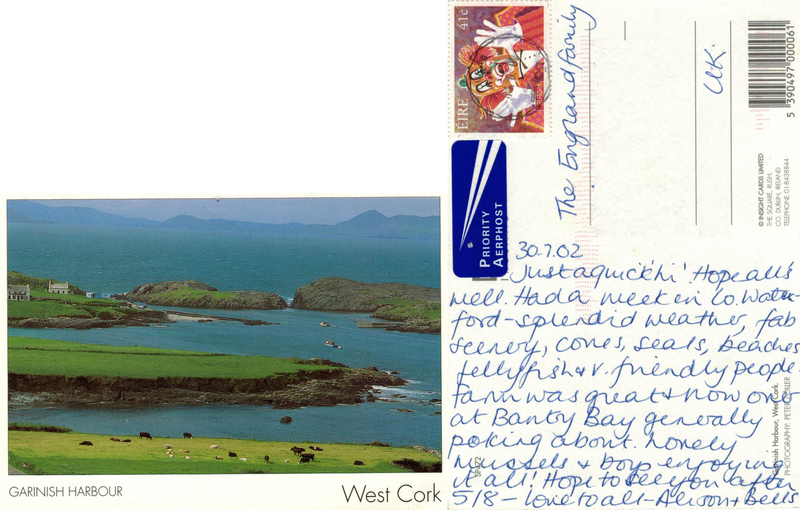 The card is postmarked ‘DURAS 01.8.02′ and carries a 41 cent Europa stamp. 2002 was the inaugural competition for the best Europa stamp design. Postcards are the social media of an era and I decided to share some historical status updates. I hope this blog inspires you to pick up a pen and rediscover the fading art of postcard writing!